Many parents and communities are sending children with special needs to the regular schools of inclusive education providers rather than SLB. This study aims to obtain information about the curriculum in the implementation of learning to manage emotions and behavior for elementary school students Special School (SLB) section G (have more than one special needs) Rawinala East Jakarta. This research uses a descriptive method. The focus of this study is the implementation of learning to manage emotions and behavior in students aged 7 to 12 years in SLB G Rawinala. Research contexts include curriculum currently used by SLB G Rawinala, the existence of learning to manage emotions and behavior for learners ages 7 to 12 years, learning objectives, methods used, materials taught, learning media. The results show that learning to manage emotions and behaviors are integrated into classroom learning, the goal is that learners can control themselves when their emotions explode. The learning method is individual. The material in teaching is dependent on the needs and conditions of the learners. Learning media used are objects that can be touched by them and not dangerous. 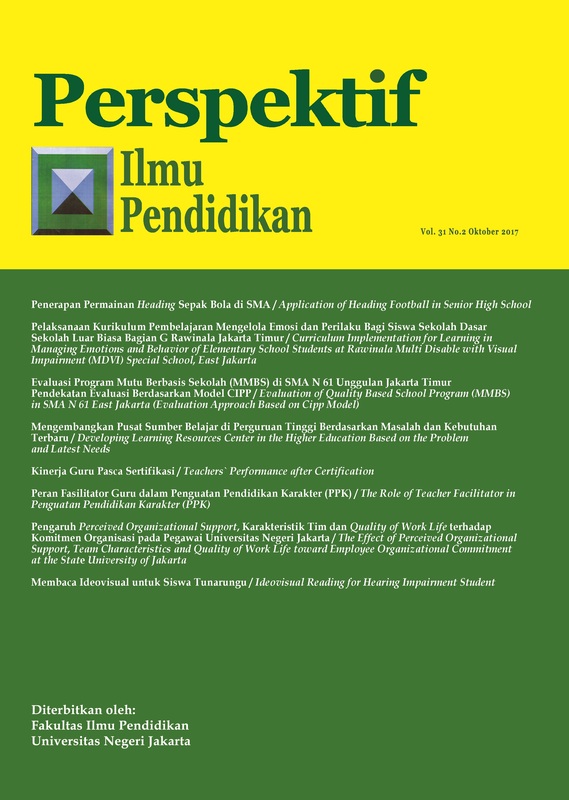 Evaluation of learning using instruments developed by International Perkins Institutions. : SLB G, curriculum, learning to manage emotions and behavior.